A staircase should not stop anyone from continuing to live in their home. Bluesky Healthcare is the local distributor of world-renowned Stannah Stairlifts in Australia, the safe, reliable and painless alternative to climbing the stairs. Bluesky Healthcare and Stannah Stair-lifts appreciate that everyone should have freedom and independence to enjoy the comfort and security of their homes, without being restricted in any way, which is why they have installed stair lifts in more than half a million homes in over 50 countries. Stannah combines unrivalled expertise with market-leading technology to build home stair lifts that are quick to install, easy-to-use, reliable and, above all, safe. What makes a Stannah Stair Lift different? Stannah builds it's stair lifts on the principles of reliable design, pleasing aesthetics, safety and long-term value. Continuous research and innovations are what keep Stannah Stairlifts at the cutting edge and ensure exceptional quality. All Chairlifts are manufactured in the UK, to make sure they are constructed to the highest standards. Your Chairlift will be directly imported from the head office in Andover, Hampshire. Not all chairlifts should be the same. Just as every home and every person are different, Stannah offers a range of features across the products – such as powered swivels and automatic footrest folds – along with an extensive selection of upholstery choices so that you can get the perfect Chairlift for you and your home.Discreet when not in use, easy to operate and designed with safety in mind, the indoor and outdoor stair lifts make life simple. The stair lifts feature remote control operation and light touch control panels and can be applied to any staircase including tricky curved staircases. 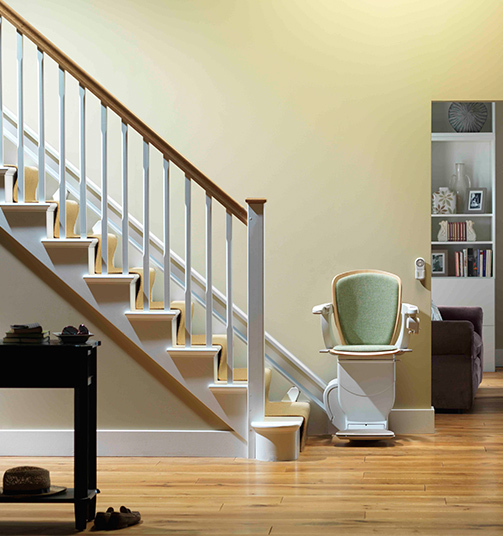 Stannah Stair Lifts: independence, comfort, durability and flexibility to suit your lifestyle. Safety Bluesky Healthcare is committed to providing you with a tailored solution from Stannah Stairlifts whose reputation for safety, reliability and design is world renowned. Stannah Stairlifts was the first stair lift company to be Quality Assured to BS EN ISO 9001:1994 (formerly BS 5750: 1989) and is fully approved to British Safety Standard 5776. 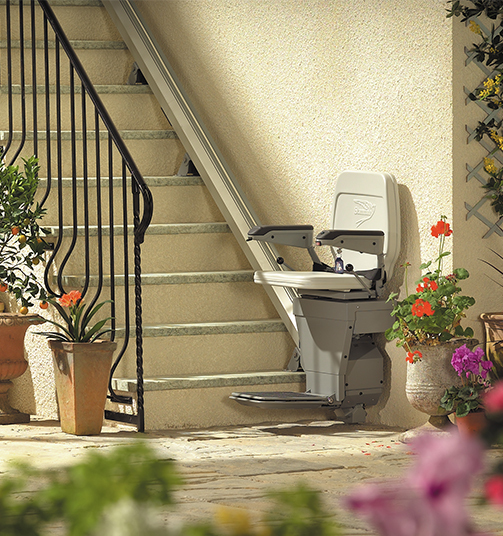 It is little wonder that Stannah is the world's most chosen stair lift. Site Survey As every stair lift is different and designed to suit you and your home; it is extremely difficult to provide a stair lift cost without having seen the staircase. Our consultants are more than happy to visit you in your home and provide you with an accurate quotation. This site survey and quotation service is completely free and involves absolutely no obligation on your part to buy a stair lift. History Stannah is a world leader in the design and manufacture of stair lifts which are renowned for their ease of use, quality, and reliability. 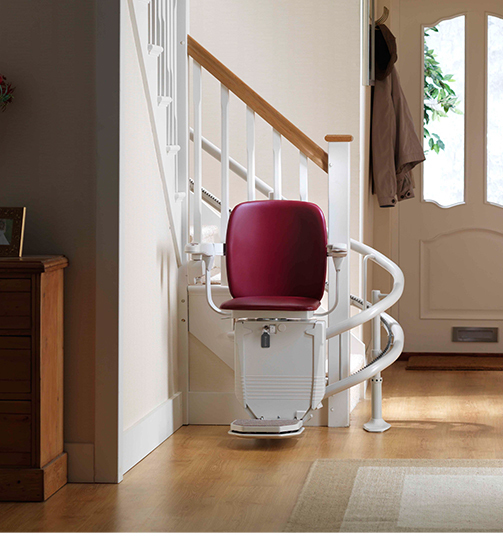 In 1975, the first stair lift was launched in the UK. In 1979, began exporting stair lifts. Won the Queen's Award for Export Achievement in 1987, 1994 and 1999. Stannah stair lifts are now distributed in 50 countries. Commitment to development Extensive research and development support Stannah's commitment to producing the best stair lifts using state-of-the-art technology. Stannah aims to offer a total product and support solution to their customers, their families, and their carers. This means that not only must the stair lifts be the best; our customer care support service must meet this high standard. Stannah is a world leader in the provision of safe, reliable, easy-to-use compact stair lifts for those that find it difficult to climb up and down stairs in their normal daily lives, regardless of age or disability. Our products are continually updated and improved with our customers’ convenience in mind.